Listen to this track, a shot of blues braggadocio from Louisiana son and master blues harpist born James Moore and known more widely as the great Slim Harpo. It’s “I’m A King Bee”, his most widely known song and a Grammy Hall of Fame (awarded in 2008 for historical significance) single that inspired many a cover version. Slim’s version was his 1957 debut, originally a B-side (of the A-side “Got Love If You Want It”), but eventually becoming his signature tune. One of the great things about this tune is Harpo’s matter-of-fact delivery, effortless, and slightly menacing too. It’s well within the popular approach to the blues that is overtly about sexual capacity, and about rivalry too – buzzing around your hive while your man is gone, no less. It’s no wonder that it captured the attention of rock bands into the 60s, a virtual manifesto for the horny young man making a play for a woman. In addition to the Rolling Stones version on their 1964 debut album, Harpo’s tune inspired a number of other bands to create their own versions this 3-minute spark of musical sexual potency, including the Grateful Dead, the Doors (who also covered the similarly themed “Backdoor Man” by Howlin’ Wolf), Aerosmith, and others. John Belushi, dressed as a bumblebee of course, performed this song on a 1976 broadcast of Saturday Night Live. It was a prototype performance that would later lead to the Blues Brothers appearances on the show, and of course the movie, too. Slim Harpo’s career was reasonably short lived. He played music only part time by the 1960s, making ends meet by running a trucking company. Yet he managed to create other blues tunes that had an impact on the rock world including “Baby Scratch My Back” (a number one single, no less), and “Shake Your Hips”, which was covered by the Stones on 1972’s Exile on Main Street. Not a bad run by a part-timer! But, by 1970, Slim Harpo was dead of a heart attack at the young age of 46. But, his influence over an entire generation of rock bands immortalizes him. 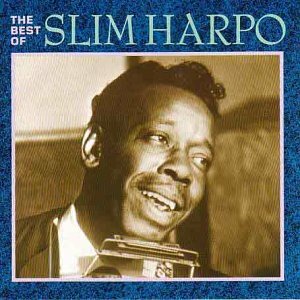 For more music, check out Slim Harpo on MySpace. Despite the popularity of his material with rock ‘n’ rollers, I think Harpo remains strangely obscure; we know the songs, but not the singer. And if you were to reel off a list of blues harpists it might go something like Sonny Boy Williamson (Rice Miller), Little Walter, Junior Wells, James Cotton and, uh, oh yeah, Slim Harpo. He recorded for Nashville’s Excello Records (I had to look that up). You wonder if his reputation would have been further enhanced had he been affiliated with Chess or another Chicago label and that whole legendary post-war, electric scene. I wonder if Harpo’s part-time status could have had something to do with it. I suppose it depends on what his motivations to be part-time were, I guess.